This is a continuation of my review of the Hyatt Ziva Puerto Vallarta, at which I stayed for five nights in May. Part 1 covers booking, general information about the property, and the Club Ocean Front Hot Tub King room. This post will cover activities and dining, as well as give a quick overview of the Priority Pass-affiliated VIP lounge at PVR. In addition to these, there are many other activities that cost extra. These include scuba diving, parasailing, banana boat rides, those obnoxious water jetpack things, and various tours and excursions; the people advertising these set up shop prominently on the beach and also occasionally walk around the beach and pool areas looking for takers. Meanwhile, there are various games and events organized by the hotel staff that occur almost hourly. The schedule for the events is posted on two bulletin boards, one near each tower, and is also supposedly accessible through the property’s dedicated mobile app. Activities include kids’ arts and crafts activities, volleyball (pool and beach), cooking and drink-making classes, and tequila and wine tastings. I had a great time playing beach volleyball and pool volleyball, as well as drunkenly participating in the “Ziva Games”, a competition between two teams of guests involving various games like capture the flag and beach volleyball using a blanket and large water balloon. Finally, there are regular outdoor dinners/banquets (discussed below in the dining section) and evening shows that are generally well-attended by hotel guests. We went to three different shows: an aquatic gymnastics show that took place at one of the main pools, a fire show, and a “cultural”-type show showcasing traditional Mexican music and dancing. All three were enjoyable, and I thought the evening entertainment options at this property were considerably better than what was on offer at the Hyatt Zilara Cancún during our visit in March of 2016. Weddings are apparently quite common at the property, and there were 2-3 during the weekend we were there. They didn’t get in the way of anything, however, and we enjoyed watching a small fireworks show from one of the ceremonies on our balcony. In addition, there is a coffee shop in the central building, and every day during lunchtime there is a small grill set up outside by the buffet. The outdoor grill was a very popular option and we ended up getting burgers/hot dogs/tacos there a few different days. Of note, the French fries are fantastic and — I’m calling it now — quite possibly the best in the entire Hyatt portfolio. Finally, complimentary room service is available 24 hours; the menu varies based on time of day and offers a pretty standard selection. Every evening, one restaurant is closed. However, about every other night there is an outdoor banquet-style dinner near the pools or on the beach. We went to two of these and were pretty happy with the vast spread and overall quality of the food. It should be noted that these banquets are more of a social activity, as all seating is at large tables rather than smaller, private tables. Dinner at PureZa, the Asian restaurant: I enjoyed this a bit more than my girlfriend did, but I thought the food was pretty good though portions were small. If nothing else, the food here is a good change of pace from what is on offer at the rest of the property. Outdoor lunch grill: I mentioned this above, but just wanted to reiterate how damn good the French fries are. And though they’re not particularly novel or exciting, the burgers are pretty tasty as well. VivaZ, the buffet: Again, my girlfriend didn’t enjoy this as much as I did, but there were a few dinners where I thought certain items were pretty good. The spread here is quite extensive for every meal, so you have to do a bit of digging (read: try lots of things) to find the gems. Overall, I thought the food selection and quality were fine at this property, but inferior to that of the Hyatt Zilara Cancún. There was nothing that I thought was particularly great, but there were 2-3 meals that were pretty disappointing. In particular, I thought the lunch we had at the Italian restaurant was legitimately bad; this is coming from someone who eats pretty much anything and everything. I could only finish about a quarter of the spaghetti dish I got, but made up for it immediately after with a burger and fries at the outdoor lunch grill. The gym is located on the second floor of the main central building and consists of one large room with standard weight machines, free weights, treadmills, and other cardio machines. Water and towels are available, and the view overlooking the beach is great. The one day I managed to drag myself to the gym, it stayed pretty empty for the ~45 minutes I was there. The spa is located right next to the gym and takes up the majority of the second floor. In addition to having a private pool and deck that only spa guests can use, there are your standard shower and locker rooms, as well as a quiet “relaxation” area with a small therapy pool and water/tea set out. We had pre-booked a 50-minute couples massage at the spa for $224 (inclusive of the 20% Hyatt Globalist discount). About thirty minutes prior to our massage, we checked in at the spa and hung out in the dedicated pool. In contrast to the busy pools below, the dedicated spa pool area was empty and tranquil, and we really enjoyed our time there. While my girlfriend enjoyed the massage, I found it to be a bit underwhelming but nevertheless relaxing. Compared to my experience at the Hyatt Zilara Cancún in the spring of 2016, I think the Ziva Puerto Vallarta shines in some areas but disappoints in others. Both, I should note, are good properties and we had an enjoyable time during both stays. Some things that I thought were better at the Ziva Puerto Vallarta than at the Zilara Cancún were the evening entertainment, the beach, and the much more beautiful surroundings and nature. I also preferred the grounds of the Ziva Puerto Vallarta to that of the Zilara Cancún, which was a bit more spread out and took more time to learn to navigate. 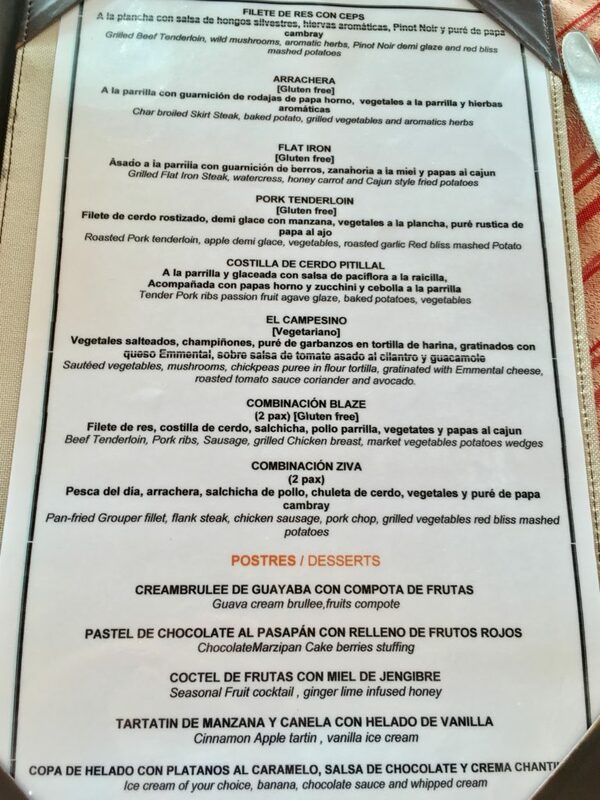 Areas in which I thought the Ziva Puerto Vallarta were inferior to the Zilara Cancún include food, which I thought was noticeably better in Cancún, and (though some might say this is equivocal) the rooms. It’s a shame that the club tower that Hyatt loyalists (why isn’t that the name of a status tier?) stay in remains unrenovated. Outside of this, the rooms we had in Cancún and Puerto Vallarta were similar, but I didn’t have to use a Suite Upgrade in Cancún, so I would give the edge to the Zilara Cancún. It’s a bit disappointing to see that it’s not uncommon for non-Diamonds/Globalists to get complimentary upgrades to the same room type that I used a Suite upgrade to confirm into. Finally, the issue of kids was a moot point for us. Even though children are allowed at the Ziva Puerto Vallarta, that was not an annoyance or detractor at all. The Zilara Cancún definitely had more of a romantic, couple-y vibe than the Ziva Puerto Vallarta, however. Overall, we had a good stay. Our room was nice, the food was decent (but drinks were strong! ), service was good, and there was plenty to do to keep us entertained. I don’t think I’ll be returning to another all-inclusive anytime soon, as that’s not my preferred way to spend a vacation, but I’d certainly recommend the Hyatt Ziva Puerto Vallarta for those looking for a relaxing all-inclusive experience. A return taxi to the airport cost 240 MXN (~$14) for 2 passengers, and the Hyatt actually has a small taxi waiting area right next to the lobby. We were able to grab a cab with no wait, and based on our conversations with the staff it seems like guests never have to wait as there are always at least a few cars waiting. At 11 AM on the Sunday we flew out, security was quick and easy. Check-in, as well, was smooth in the AA line, though the Aeromexico non-priority check-in line was so long it nearly snaked outside of the terminal; I’m not quite sure what that was about. There is a single Priority Pass lounge at PVR, the VIP lounge, and it’s located near the Food Court in Hall A. The lounge is spacious and well-lit, with large windows that give good views of the apron, though there were no planes that morning in the area the lounge overlooks. For the majority of the time we were there, there were 15 people at most in the lounge and it remained pretty quiet. Surprisingly, there was a dedicated waiter who both provided table service and doubled as the bartender. The bar had your standard basic liquors, while the morning food selection was what you might expect at a Priority Pass lounge. The only negative in my book was the very slow wifi. Overall, it’s a fine place to get away from the chaos of the terminal and spend some time before a flight.